Someone recently told me that this, your Newtown Pentacle, was a mere paparazzi rag for infrastructure and heavy industry- which made me laugh out loud. Then, depressed, disturbed, and frightened by even good natured criticism I retreated into a sulking and jealous rage. All ‘effed up, I threw together my little ensemble of camera bag and headphones and set off for the Newtown Creek. When I got to the Pulaski Bridge, it was open and I realized that I had just missed a Tugboat passing through. ARRGHH!!! 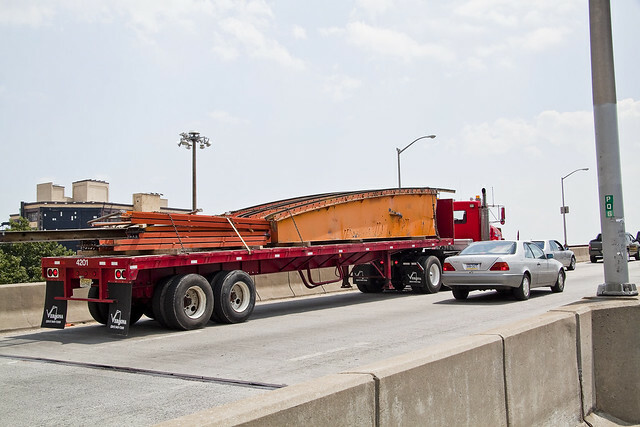 What I did see though, was this flatbed truck carrying what appears to be remnants of a Roosevelt Island Tramway tower in the direction of Greenpoint. Brutally hot, vast misty shelves of humid air blanketed the terrain when the Pulaski reconstituted itself into its roadway configuration via those electrical engines that operate its double bascule mechanism. Tepid, the fetid air flow’s tortuous languor augmented that remarkable and certain odor which distinguishes the Newtown Creek watershed. At the apex of the arc which spans this part of that storied rivulet, this small boat was spied. As its markings indicate, this is the Emily Miller. 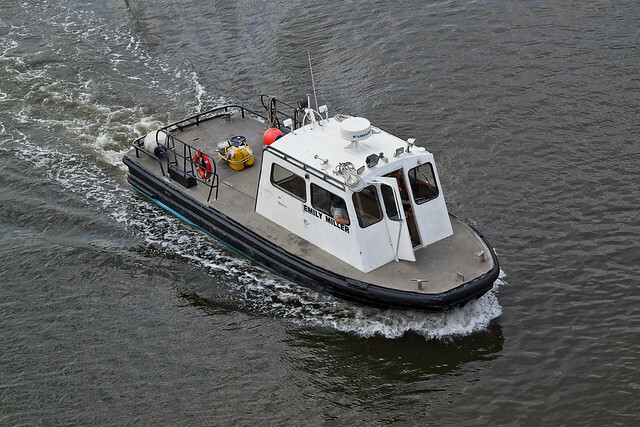 A “Job” or Utility boat, Emily Miller is 31 feet long, 185 HP and based at Pier 7 1/2 in Staten Island at Miller’s Launch. 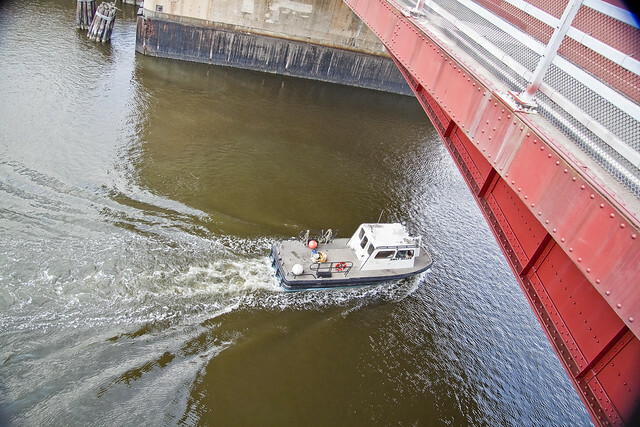 Miller’s Launch is a marine service company based on the North Shore of Staten Island, New York. 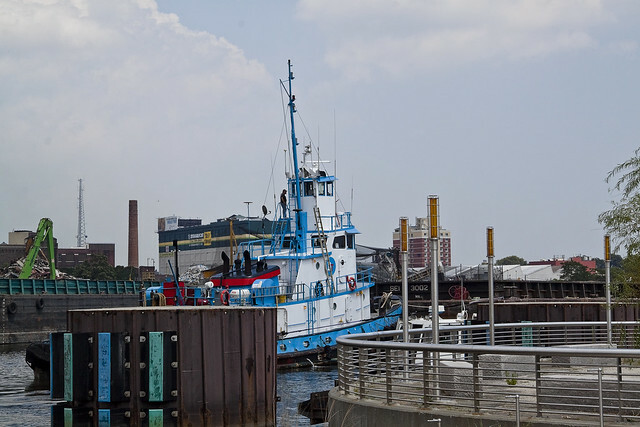 With satellite terminals throughout New York, New Jersey and Connecticut, we have provided first-class service to the marine industry since 1977. Nothing special, really, but since I missed the Tug… I decided to take some shots of it passing anyway. 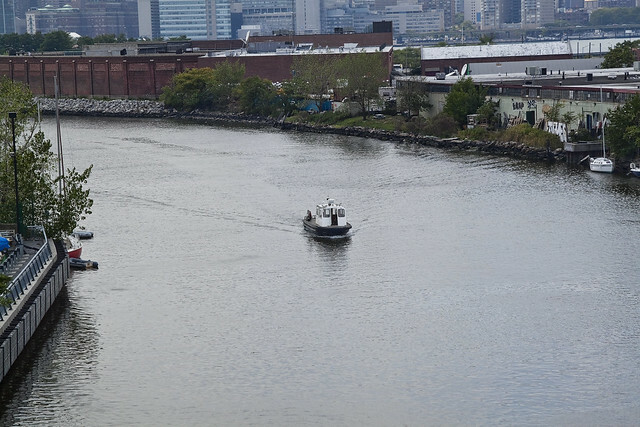 For a waterway that was once the busiest on Earth, the relative scarcity of traffic on Newtown Creek these days makes any vessel plying its poison expanse notable. My endless wanderings found your humble narrator once more at the Newtown Creek Waste Water Treatment Plant Nature Walk, always an easy egress point for observing the malefic realities of Newtown Creek and one of the few water level access points open to the general public along the great canal. To my wonder and joy, I found the tugboat that I had missed when the Pulaski (and this post) opened. 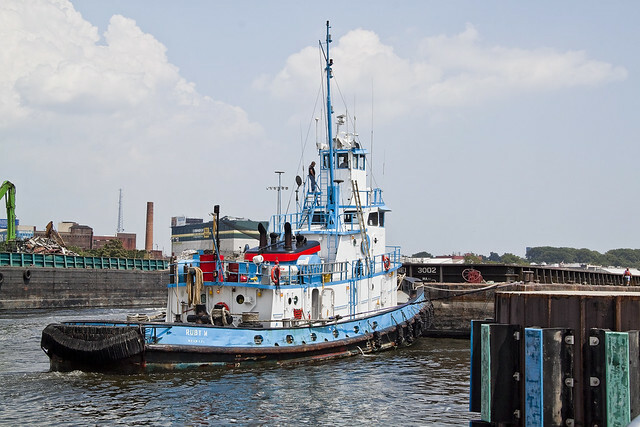 The tug is the Ruby M. operated by Dann Towing, but once once known as he Texaco Fire Chief when it was built in 1967 at the Jakobson Shipyard in Oyster Bay. Steel hulled, it is 95 feet long and has a gross tonnage of 197. It was sitting astride Whale Creek, and maneuvering a barge into position. 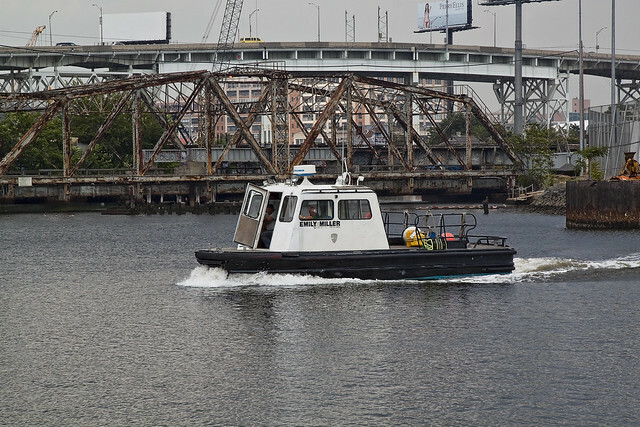 Tugboats are seldom observed at work this close, and certainly -in my limited experience- it is a rare thing to see one in such a nearly static position relative to the camera. Normally, you have to shoot fast to capture one, as it is hurtling past. The Newtown Creek Waste Water Treatment Plant, incidentally, sits on the site of one those insane fires which Greenpoint seems to have been quite prone to and distinguished by during the heady days of the industrial revolution. Check out this NYtimes article from 1900 which describes the horror. Daring contact with that which might exist in the shallow depths, your humble narrator descended those threatening steps found at the Nature Walk, and was rewarded with this found composition. Unlike most of the photos presented here, its presence is not meant to advance a narrative or illustrate a point- I just think its a neat shot. Having little else to do, I hung around for a while to see if the Ruby M. was about to do something interesting. It didn’t, just repositioning itself further up the creek and tying off to a different barge than the one they had just delivered. 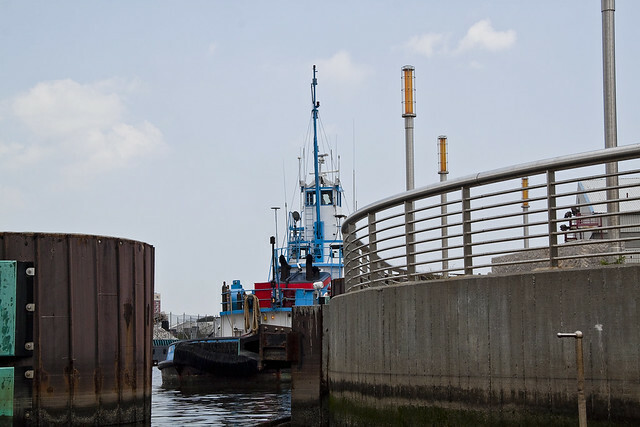 Emily Miller’s role in the transaction seemed to have been completed as well, as it advanced past the rail bridges spanning the Dutch Kills tributary of the Newtown Creek.